I’m trying to find different ways to serve vegetables to Page. She has a new found love for pizza–before she wasn’t at all impressed. Recently, I’ve started to get her involved in helping me to make the meals we’re eating. I saw a food documentary about food, and kids. In it the narrator said that the best way to get kids to eat vegetables is to have them take part in cooking. Page is at that age where she’s very eager to help, so I thought why not take advantage of that. 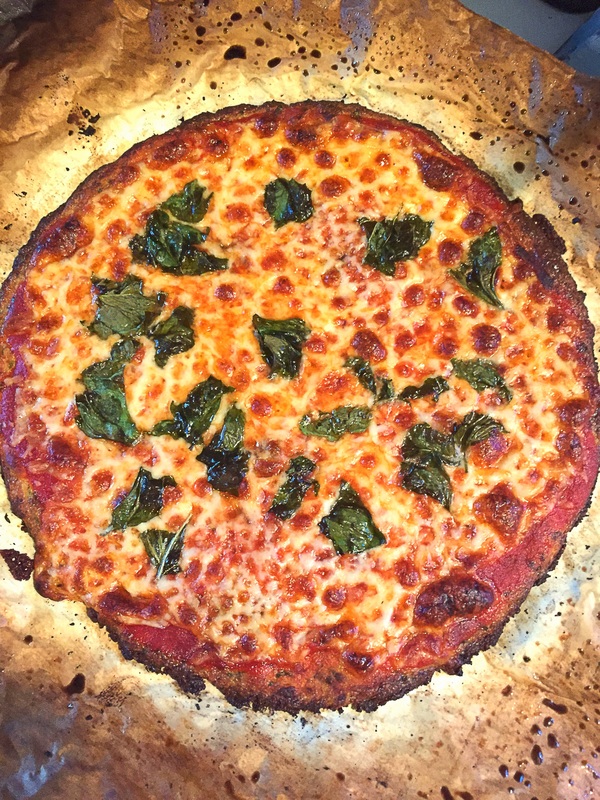 I’ve also really wanted to try out a cauliflower pizza crust on our new baking steel. I have to say that I was more than impressed with the results–so was Page. Now for those of you wondering if this will taste anything like that delicious yeasty bread that you’re used to with pizza–the short answer is no. 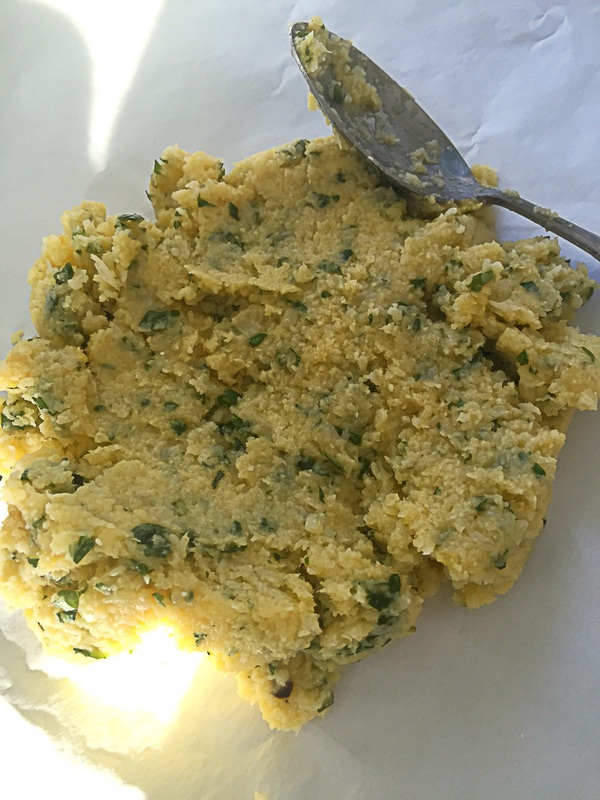 Bread is bread–this is an alternative to bread. Although it’s not bread–it mimics bread in form, and it is so delicious that it stands on it’s own. The reason cauliflower is most often used by people as a substitution for grains is because it has such a mild flavor. It also has great texture. This recipe requires that you add cheese. 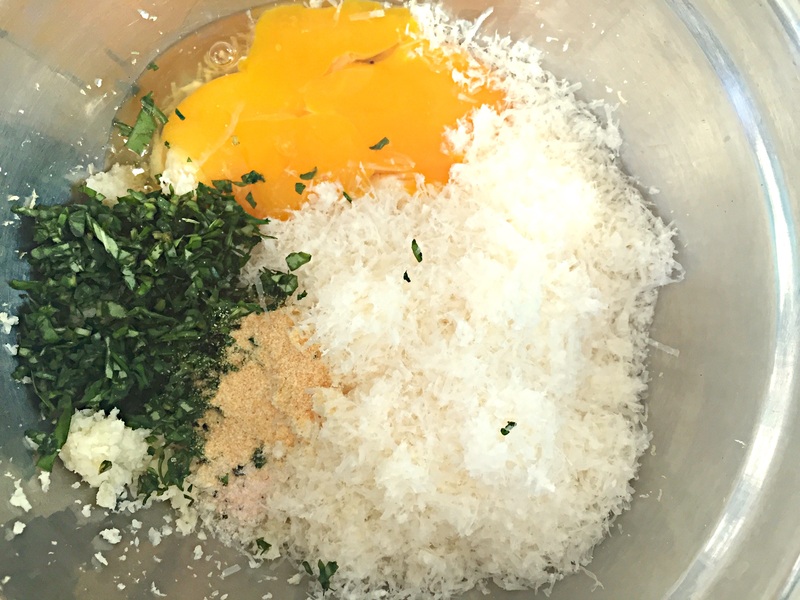 I used parmesan, but you could use mozzarella, or pecorino, or a combination of your favorite Italian cheeses. 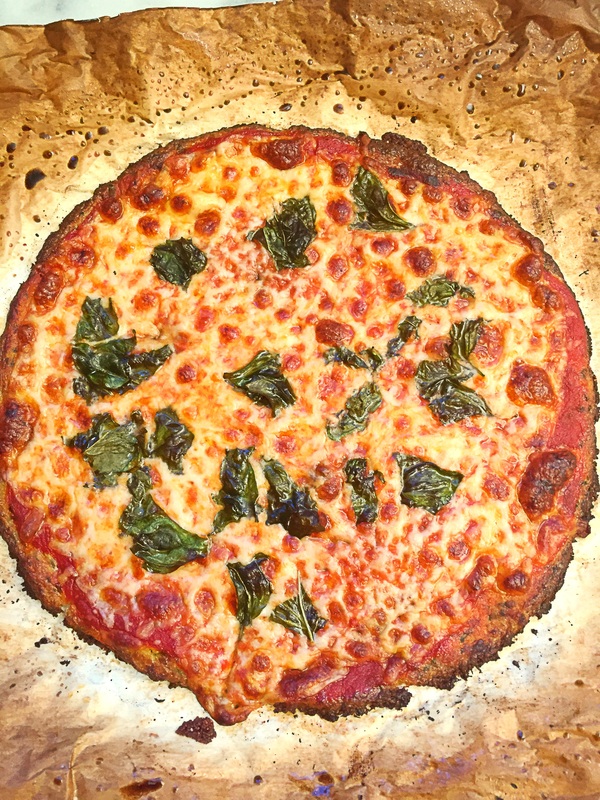 I also used fresh basil, but you can use rosemary, or another herb of your choosing, dried or fresh–totally up to you. Directions: Pre-heat your oven and pizza stone or baking steel to 450F for 45 minutes. 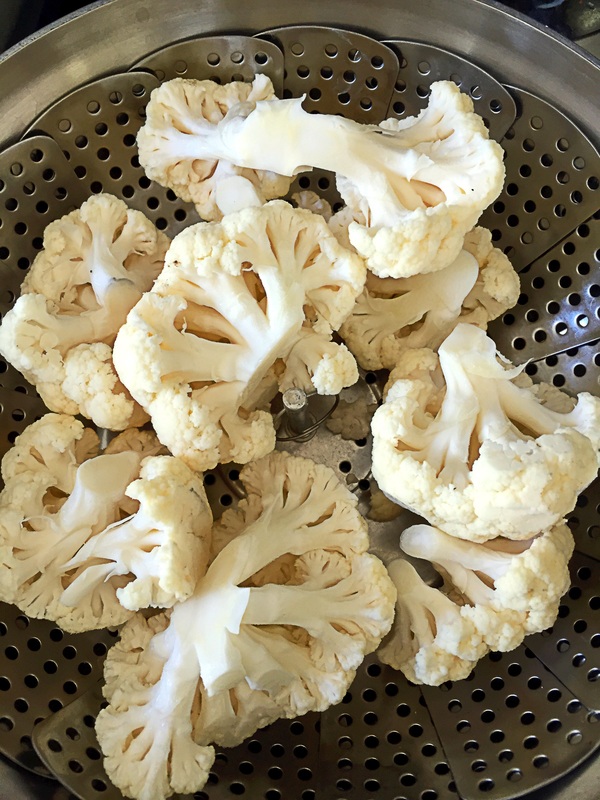 Steam the cauliflower for 5-7 minutes–or until fork tender. 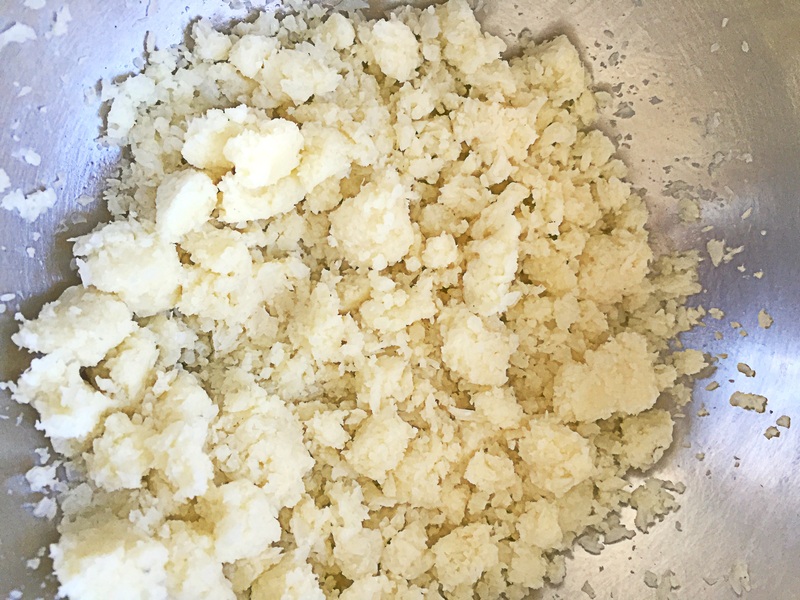 Transfer cauliflower to a processor and process until cauliflower looks like grains of rice. 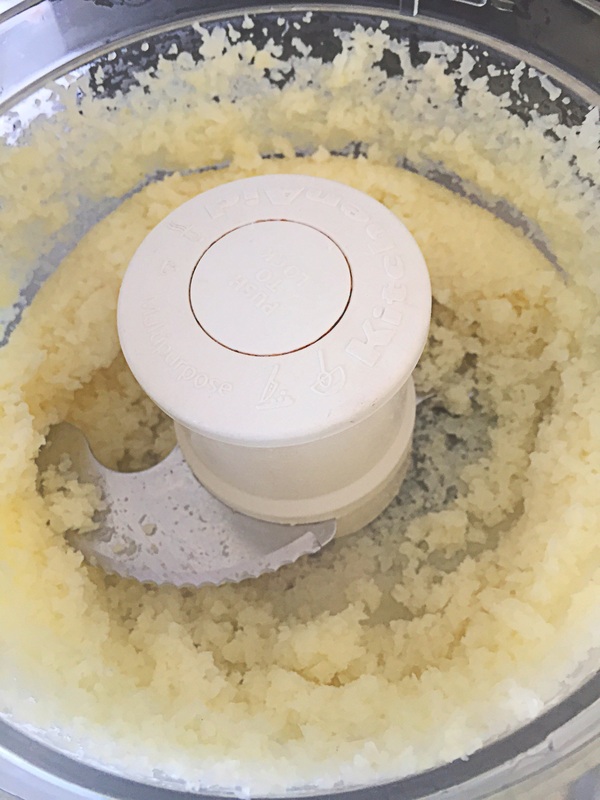 Transfer processed cauliflower to a clean kitchen towel, or a nut milk bag, and squeeze until the cauliflower becomes dry. You want to squeeze out as much water as you can. 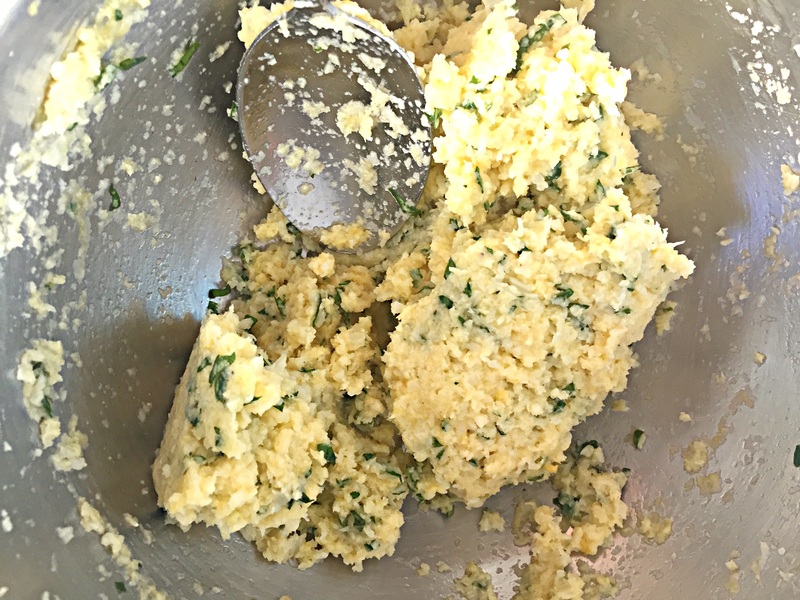 Transfer the cauliflower to a medium size bowl, and add garlic powder, salt, basil, and cheese–mix together into a ball. 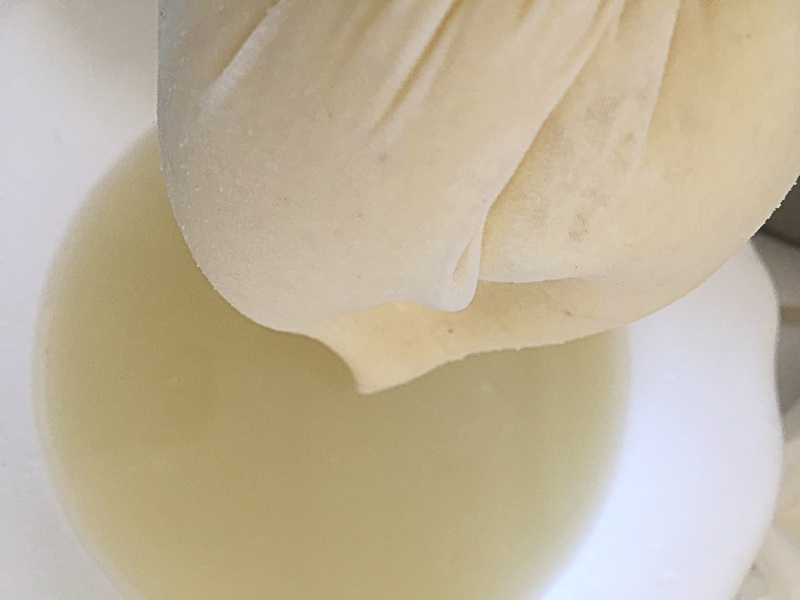 Spray a sheet of parchment paper with oil. 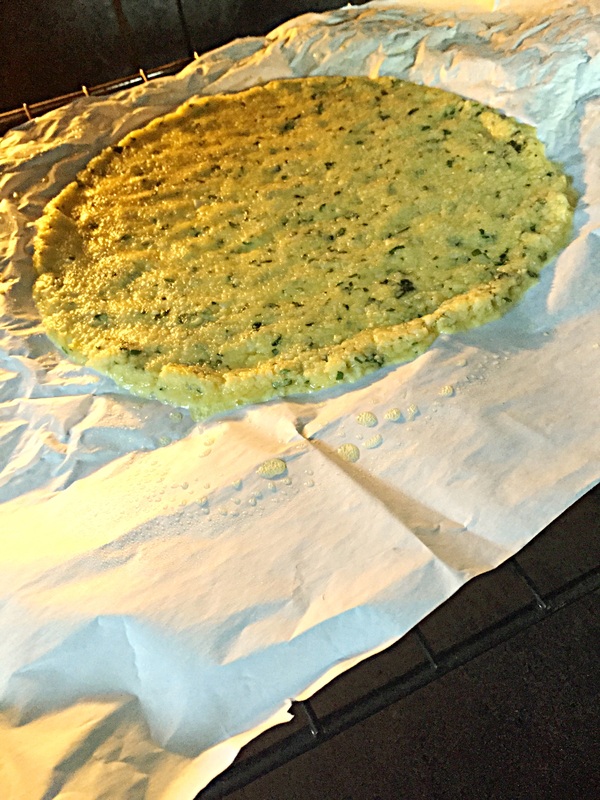 Add the cauliflower mixture to the center of the parchment paper, and with your hands begin to flatten and form it into the shape of a pizza. Once you have the shape you want, place it in the oven for 10-12 minutes. Once it’s golden brown and bubbly like this: remove it from the oven. Now you can top it with your favorite tomato sauce, cheese and toppings. 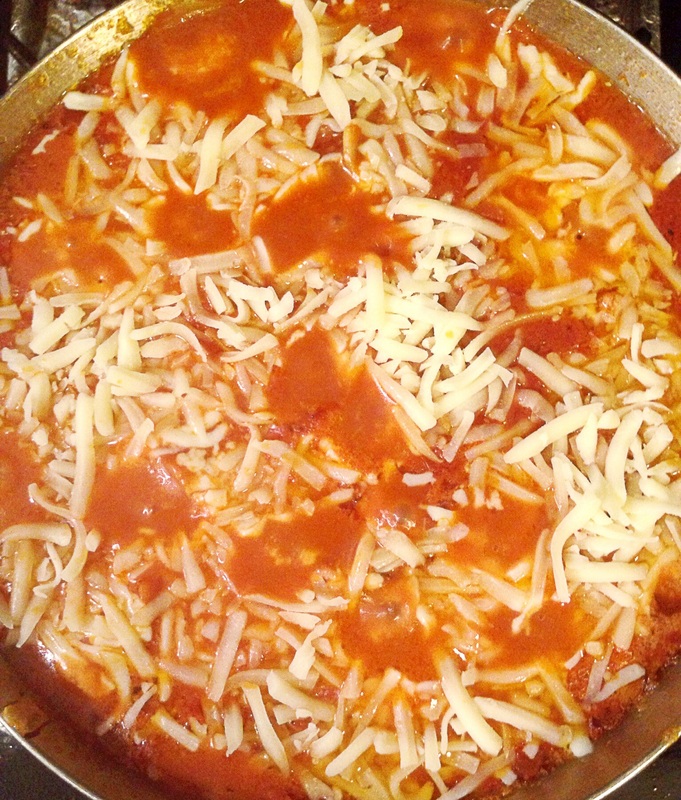 Once you have it topped, place it in the oven to cook until the cheese and topping melt. Remove from oven, cut serve and enjoy! This made a 10-12 inch pizza, not a crumb was left over. 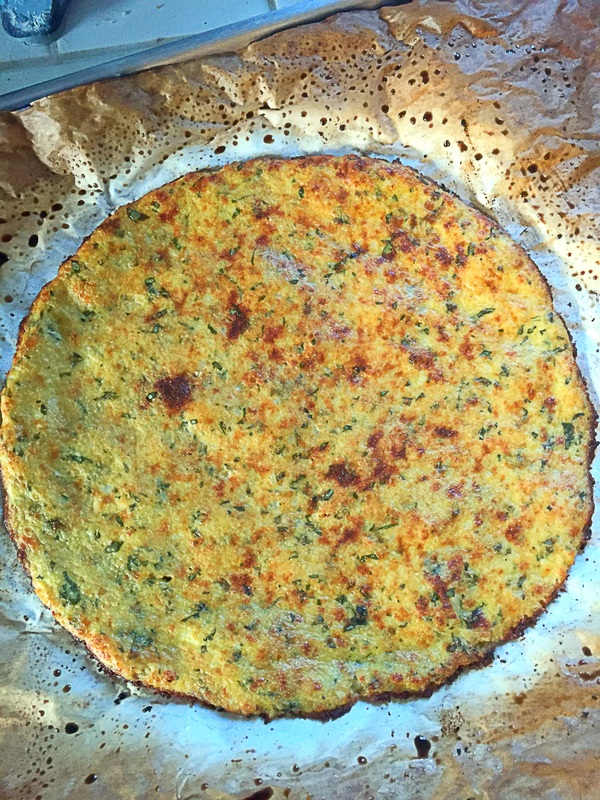 Everyone enjoyed it–my husband didn’t even know that the crust was made from cauliflower until Page told him! 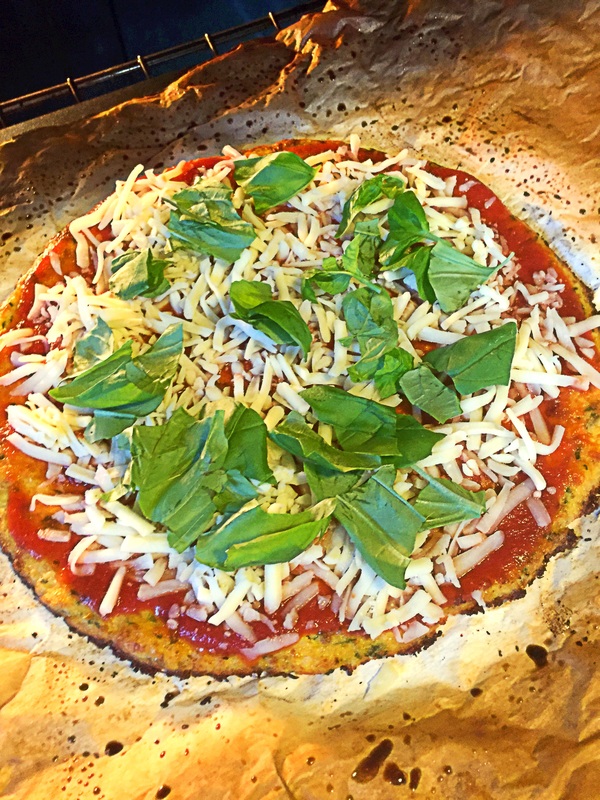 If you like this try my recipe for Tortilla Pizza! 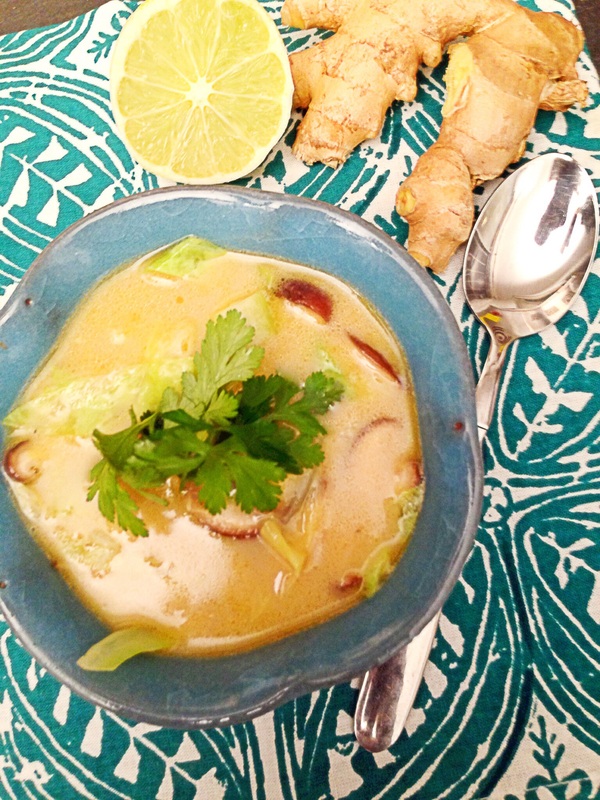 One of my favorite soups to get when we go out to eat Thai food is Tom Yum soup. 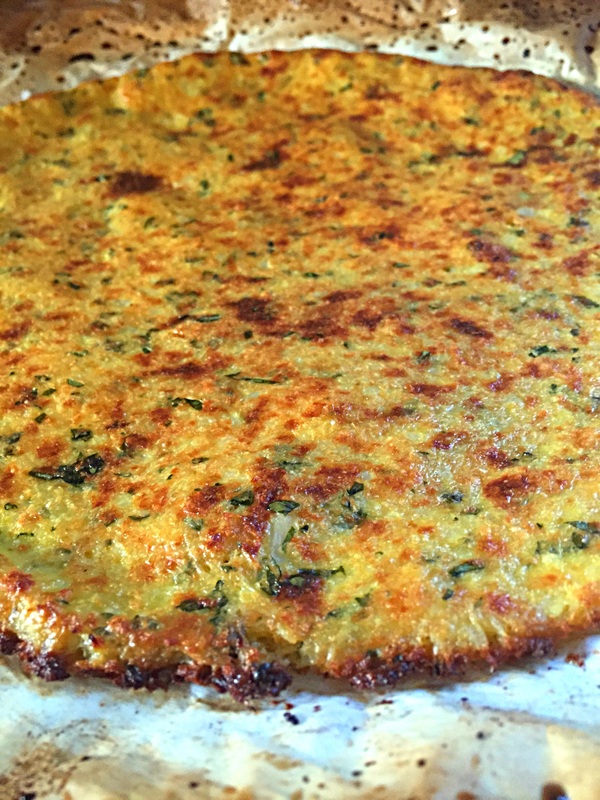 It super easy to make at home, and if you make it vegetarian it’s super quick to make. I used some of my home made chicken stock as a base for this, but if you’re vegan or vegetarian, you could just as easily use a vegetable stock, and skip the fish sauce. 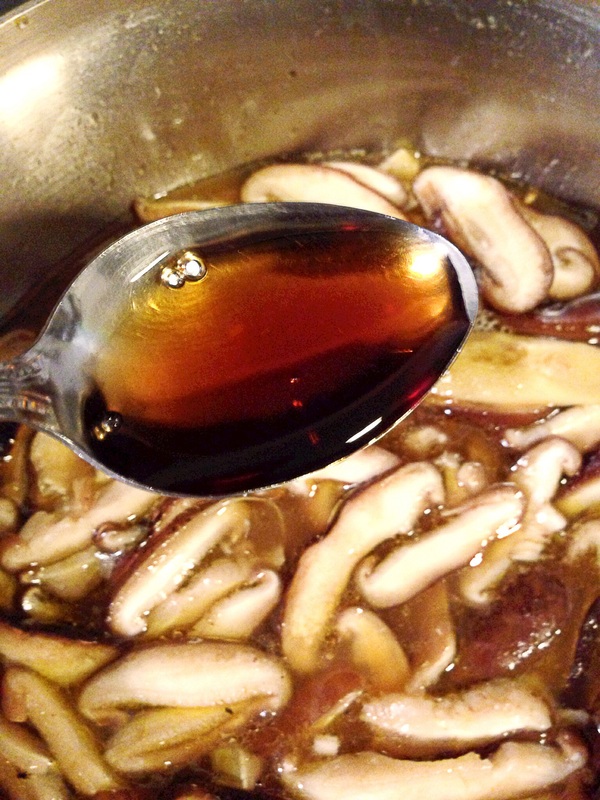 3-5 tablespoons of Fish sauce–really to taste since fish sauces vary by brand. 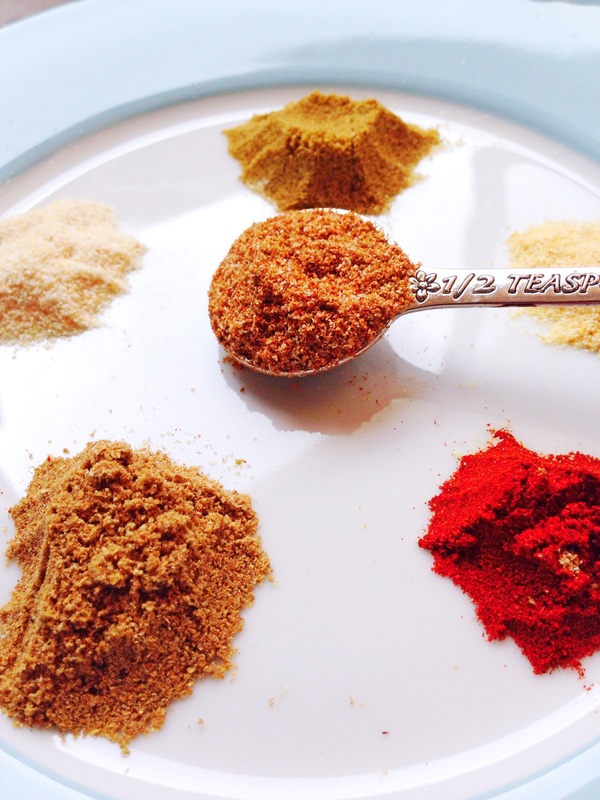 I used red boat, and about 5 tablespoons, but I know I couldn’t add that much with other brands that are more salty. Start with 2 and add more gradually until you’re satisfied. 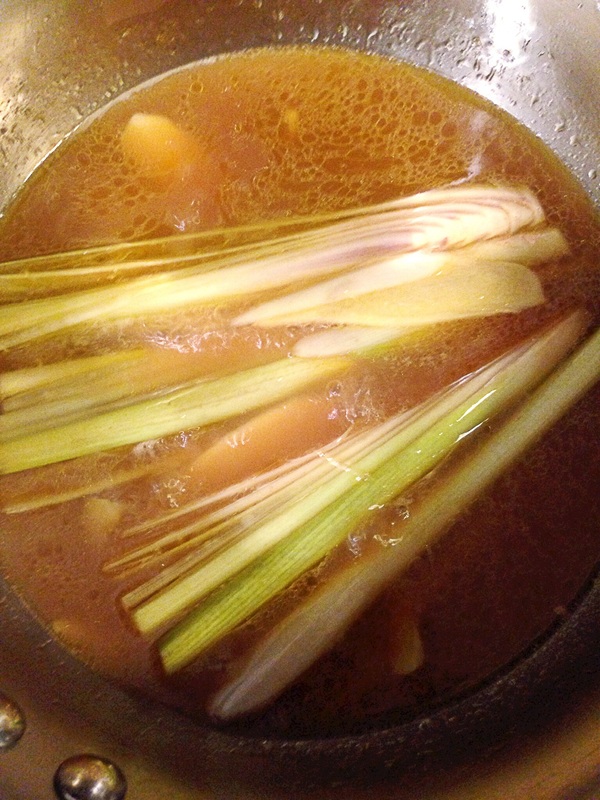 Add the stock, lemon grass, and ginger to a medium sized sauce pan, and bring to a simmer. 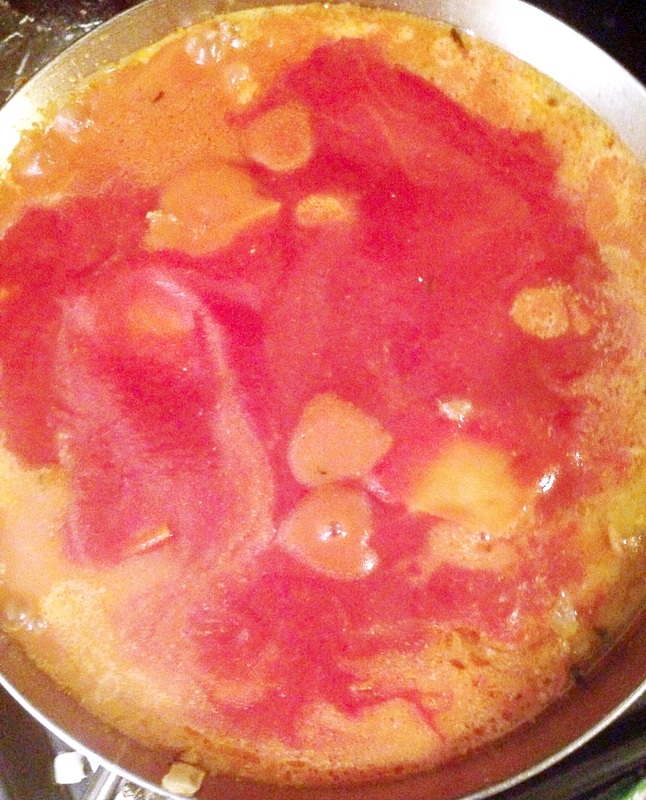 Let cook for 5 minutes so that the stock gets infused with the flavor of the lemon grass and ginger. 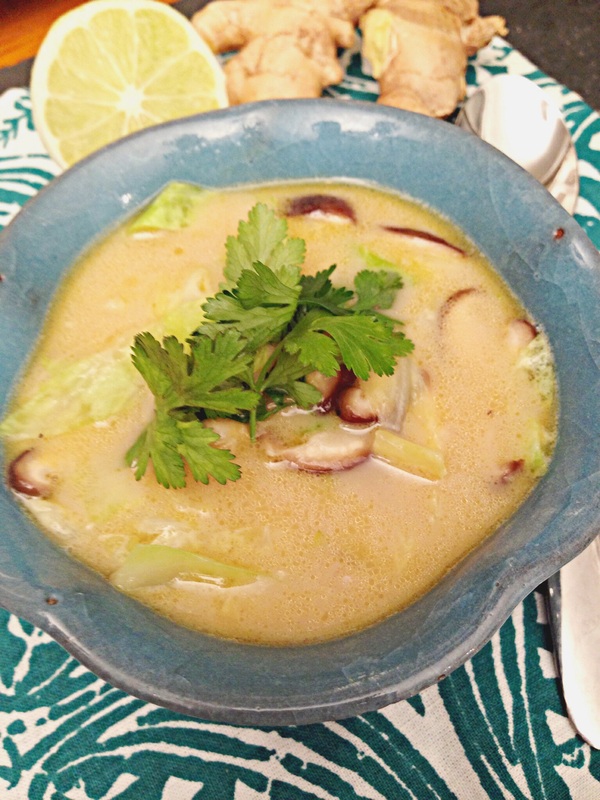 Add in the cabbage and coconut milk. 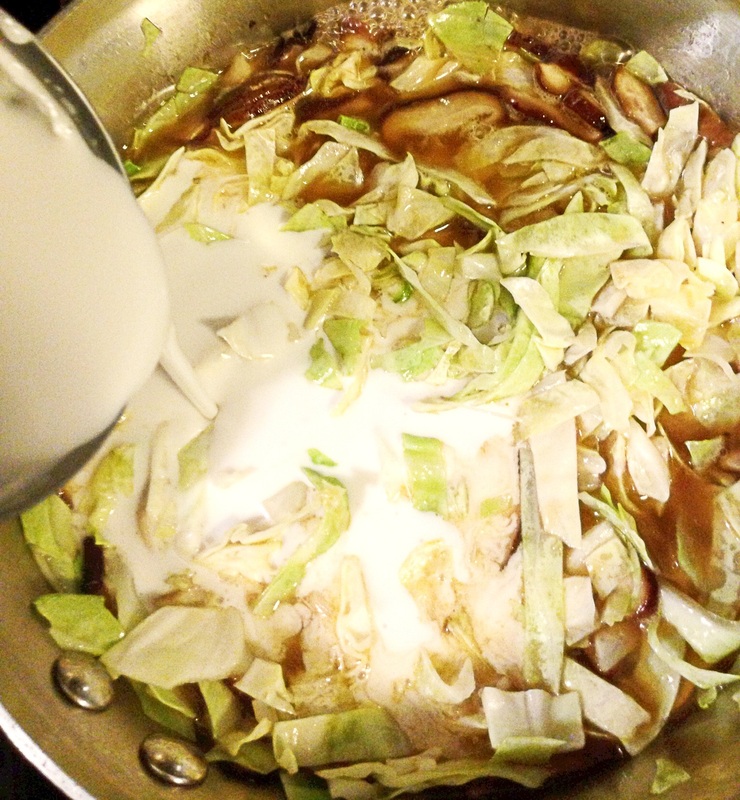 Allow the soup to cook for another 5 minutes or just until cabbage is nice and tender. Turn off the fire, top with cilantro, and red chili flakes, and enjoy!!! These last few weeks have been a whirlwind, I have been burning both ends of the candle wick for some time now, and it finally caught up with me. But even when mom is sick, our kiddies still need to eat! 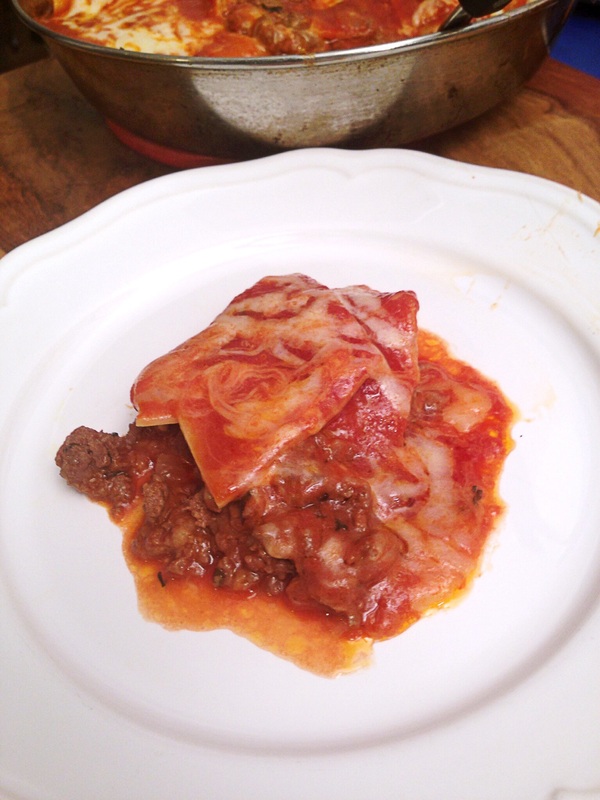 I normally use all of these ingredients to make my lasagna, but I make the meat sauce on the stove, then transfer the sauce to a bake pan and layer it over the noodles, top with cheese and finish this in the oven. However, because I was sick, I thought why not just try this on the stove top. Surprisingly it worked! 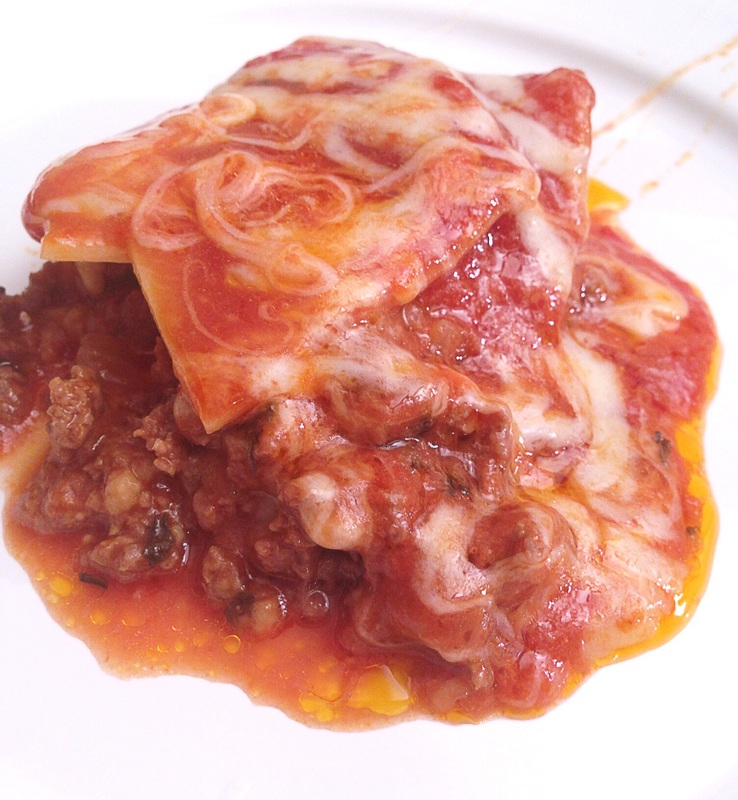 This lasagna is the ultimate in lazy cooking, but it yielded the best lasagna that I’ve ever made, and the easiest! 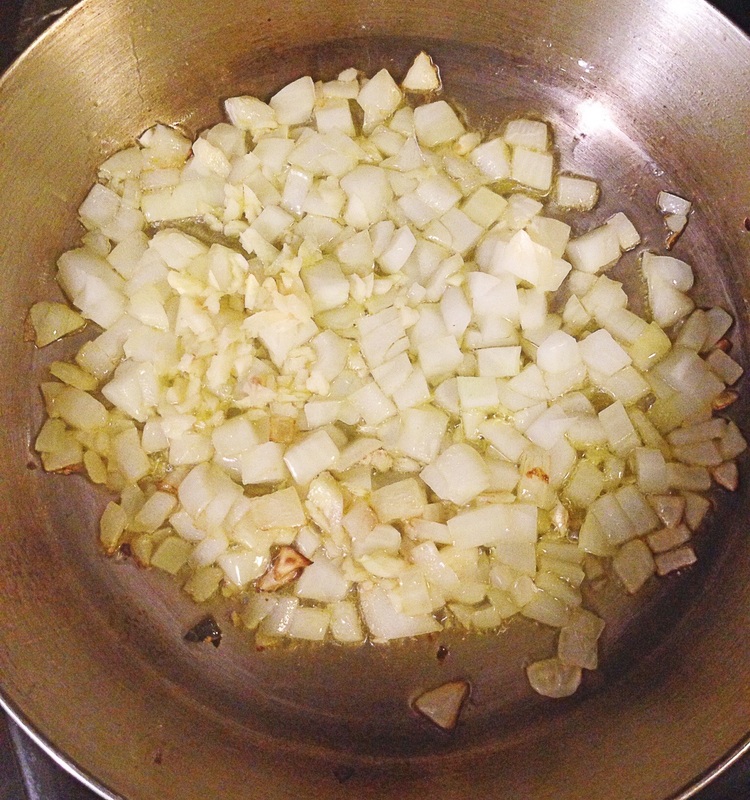 Directions: Heat olive oil in a saute pan, add in onion and garlic and cook until onion turns translucent. 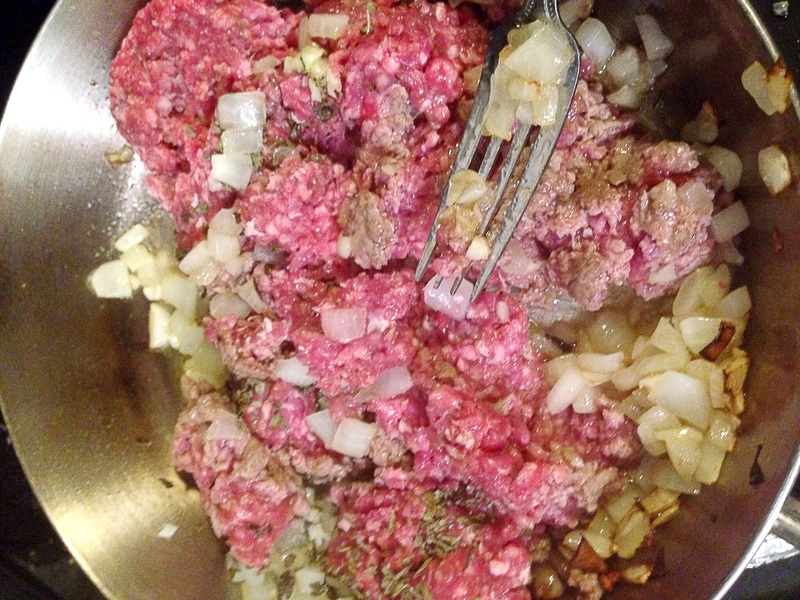 Add in ground meat, season generously with sea salt and cook until brown. 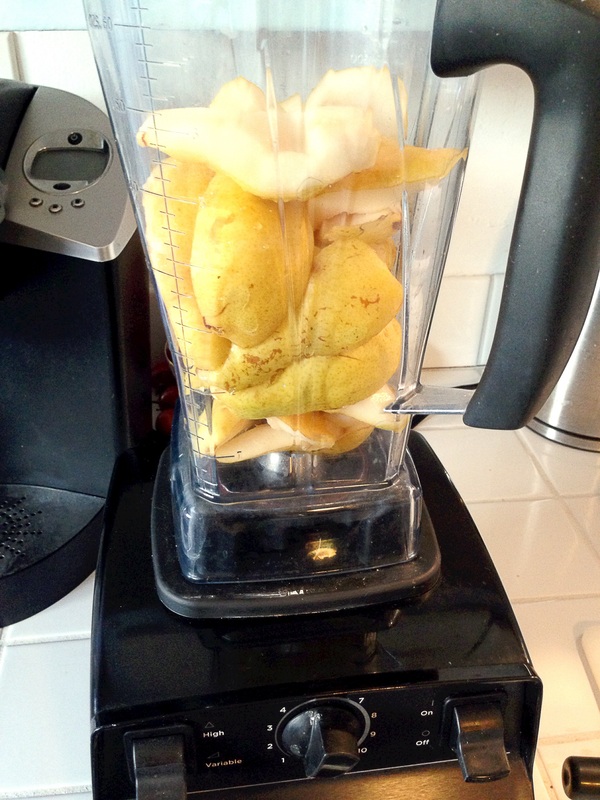 Drain any excess fat. Top with the remaining sauce, making sure that all the noodles are completely covered and submerged in the sauce. Cook on medium low heat until the noodles are cooked through. 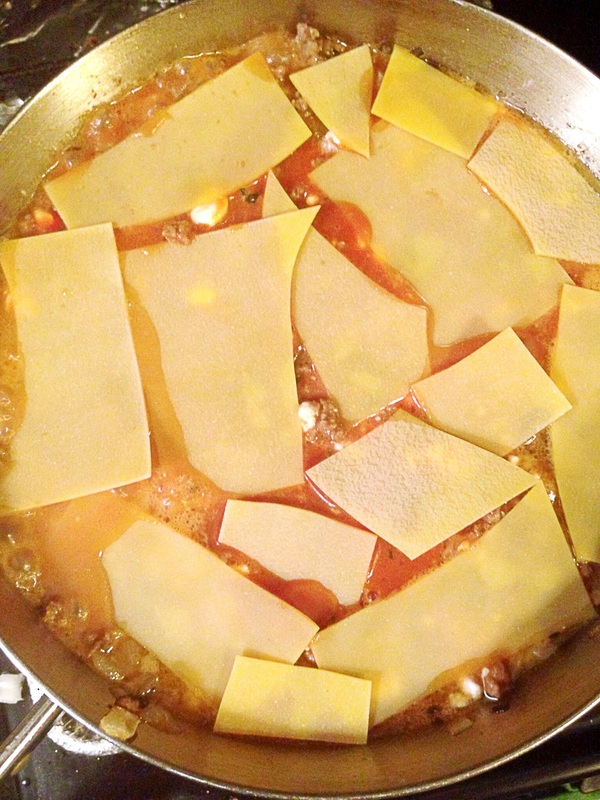 Once noodle are done, top with cheese, cover and cook for an additional 2-3 minutes, and the cheese has melted. I used to be the queen of packaged seasoning, if they made it I tried it. 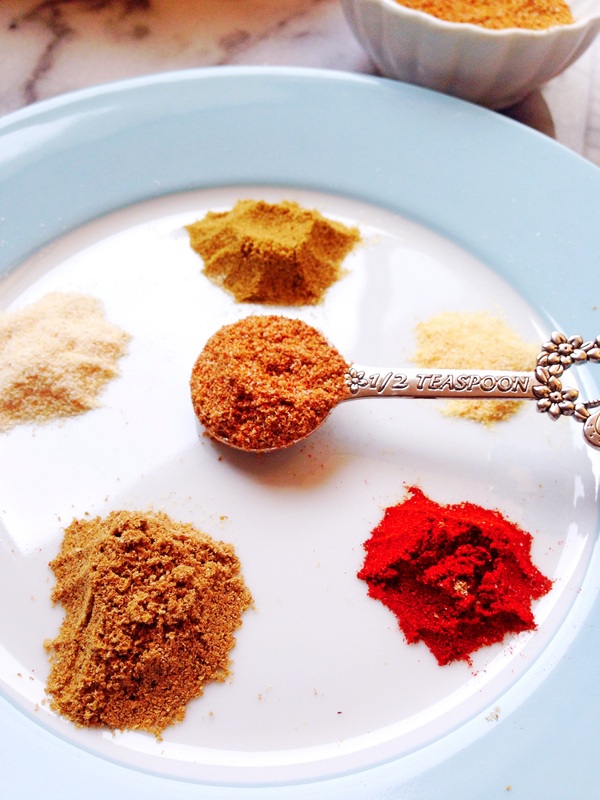 It never really occurred to me that I could just as easily make most of these seasoning with spices that I already had in my pantry. 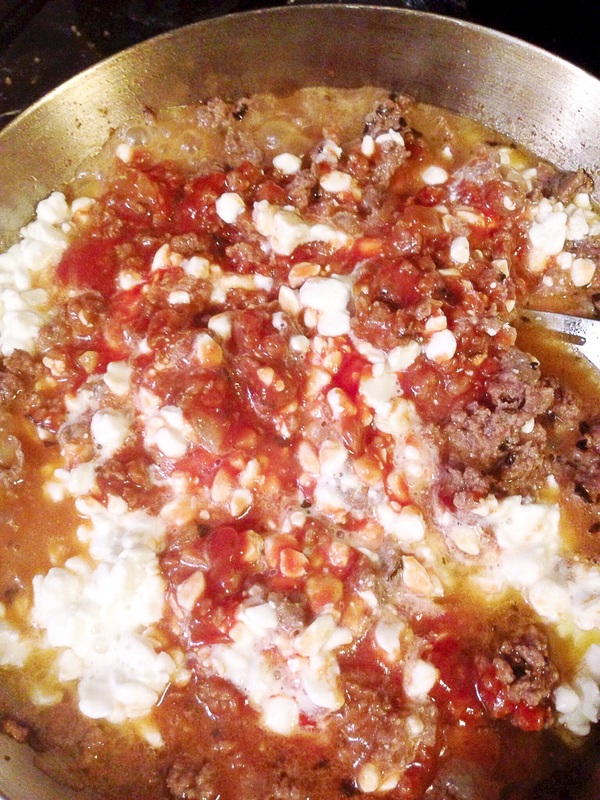 It wasn’t until I was in the middle of browning some ground meat to make tacos that I realized I was missing one key ingredient–the taco seasoning–and I was forced to make due with what I had. That was a fateful day indeed. Enlightening and freeing! I no longer buy pre-made seasonings. I just make my own. This taco seasoning is equally as good as the prepackaged mix that I used to buy, except it doesn’t have any cornstarch or any of the other fillers that packaged seasonings tend to have. 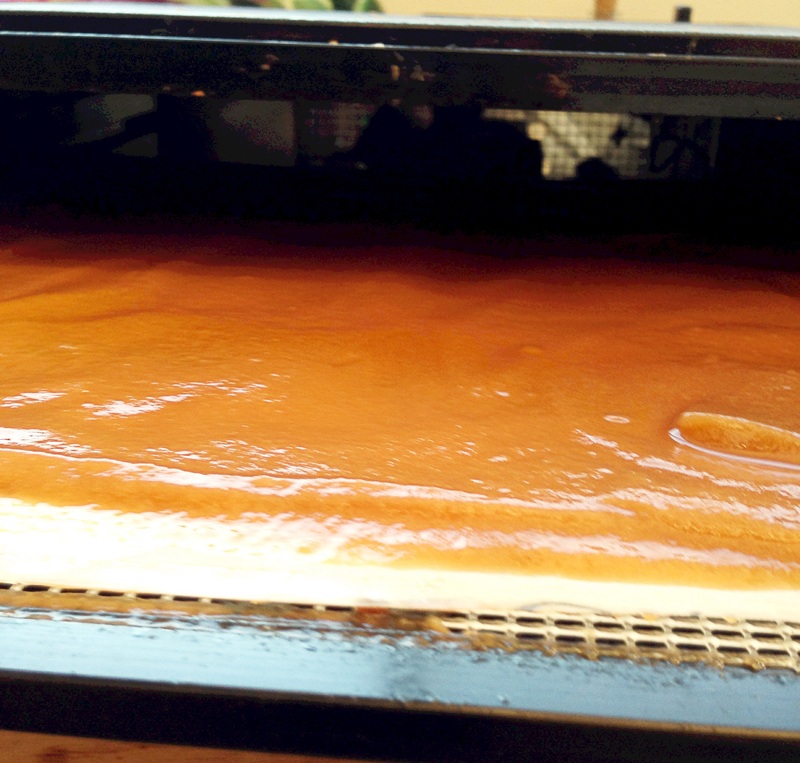 One of my favorite ways to use ripe fruit is by making fruit roll-ups. In my opinion it’s the best way to use fully ripe fruit, because the fruit is ripe, it’s very sweet, and that means that you don’t have to add sugar to make these fruit roll-ups great. 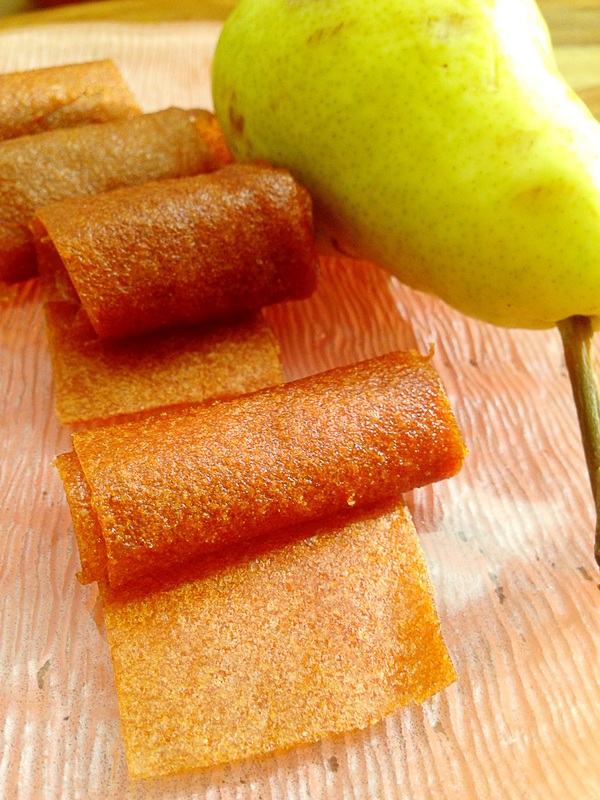 Additionally fruit roll-ups are so super easy to make and a great way to reinvent a fruit that you have an abundance of. 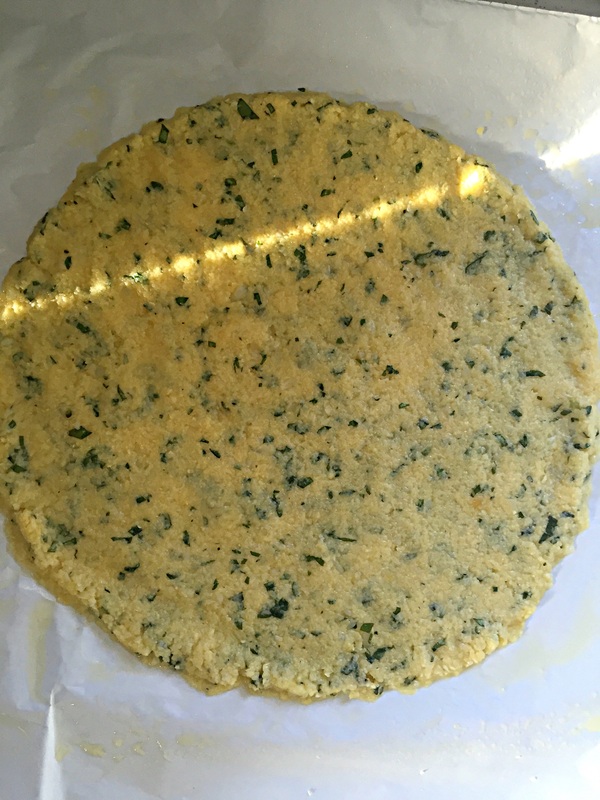 I have dehydrator, but these can be done in an oven. Just set your oven to 150 or the lowest possible setting. If you don’t own a dehydrator yet, I suggest that you get one, they are really inexpensive around $40-$50 on the lower end–these work fine, and $299 on the higher end. But they are so useful! At the least you’ll be able to make some of my favorite fruit roll-up recipes like: Tropical punch fruit roll-ups, pineapple fruit roll-up, Strawberry-apple fruit roll-ups or strawberry fruit roll-ups. 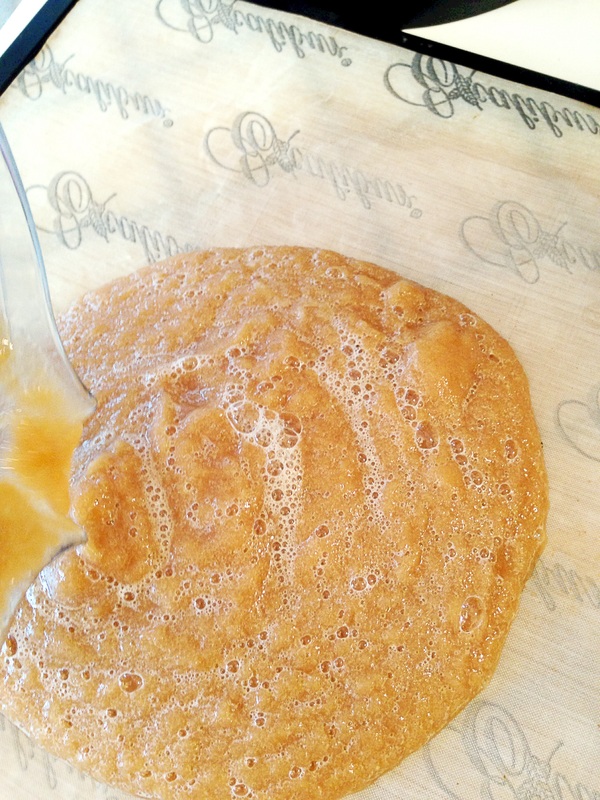 Pour the pear puree out onto a piece of parchment paper or a silpat, and smooth out into a thin layer. Place in a dehydrator on 134F for 4-6 hours. Alternatively you can place the parchment paper or silpat on a cookie sheet and place in the oven on the lowest setting for 4-6 hours. I was at the farmers market this past Sunday, doing my usual weekly shopping. One of my favorite vendor’s had these beautiful stalks of brussels sprouts. I got so excited about them that a woman, who was also shopping, pulled me aside and whispered : “How do you cook those?” This isn’t the first time this has happened to me, believe it or not, people stop me all the time, either at the farmers market, or at Whole Foods, to ask how to cook a variety of vegetables. The funny thing about people asking me cooking questions is that they almost always whisper the question? I don’t understand why they whisper the question! 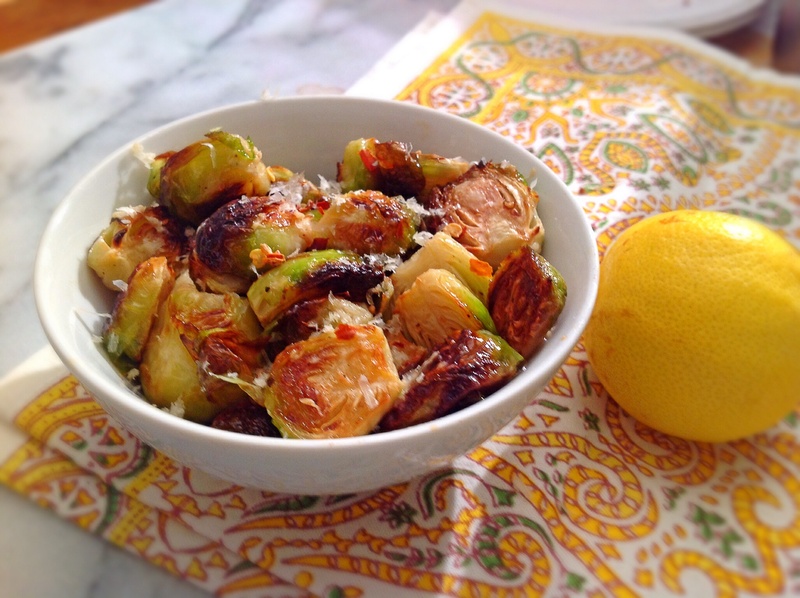 I want to tell them, “you know you’re not the only person on the planet who has no idea what to do with ((insert name of vegetable here)).” I shared this recipe for roasted brussels sprouts with the the lady at the farmer’s market. 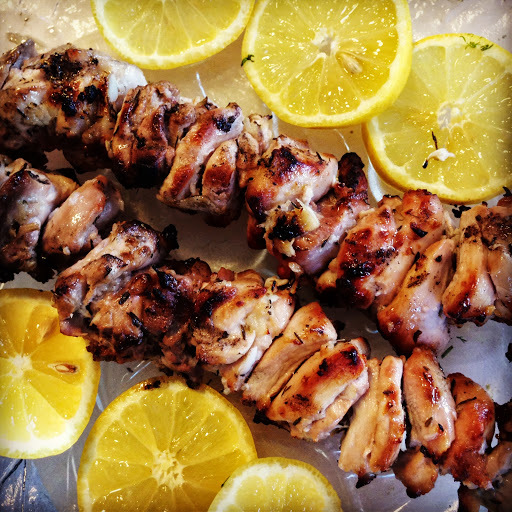 It’s simple, easy and so delicious. 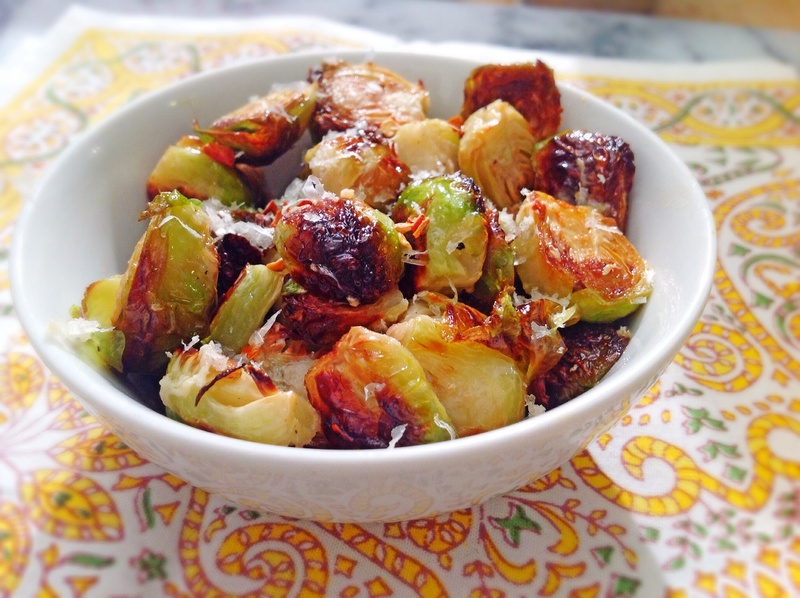 It’s one of my absolute favorite ways to cook and eat brussels sprouts. Directions: Pre-heat the oven to 425F. Add the lemon juice and red pepper flakes to a medium sized bowl and set aside. 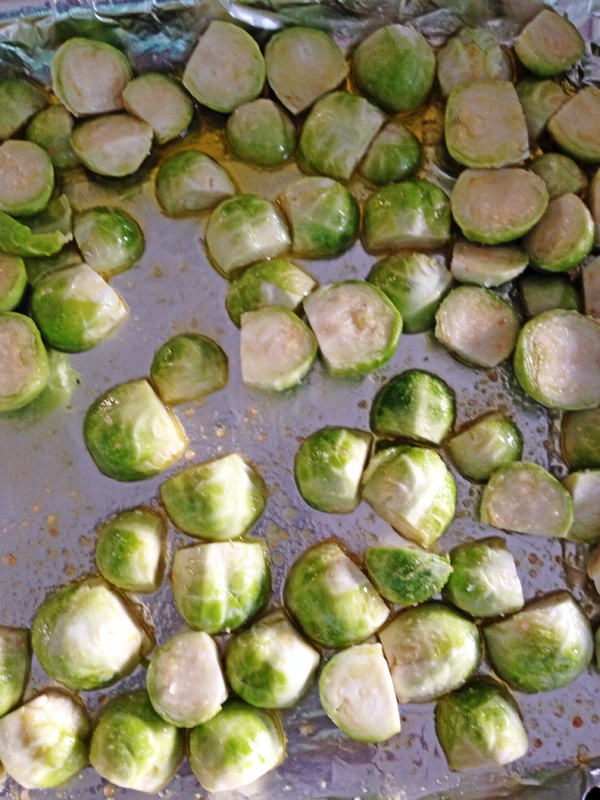 In a medium bowl add the brussels sprouts, oil and sea salt, toss well making sure that all the brussels sprouts are evenly covered with oil. Place on a foil lined baking sheet and put in the oven. 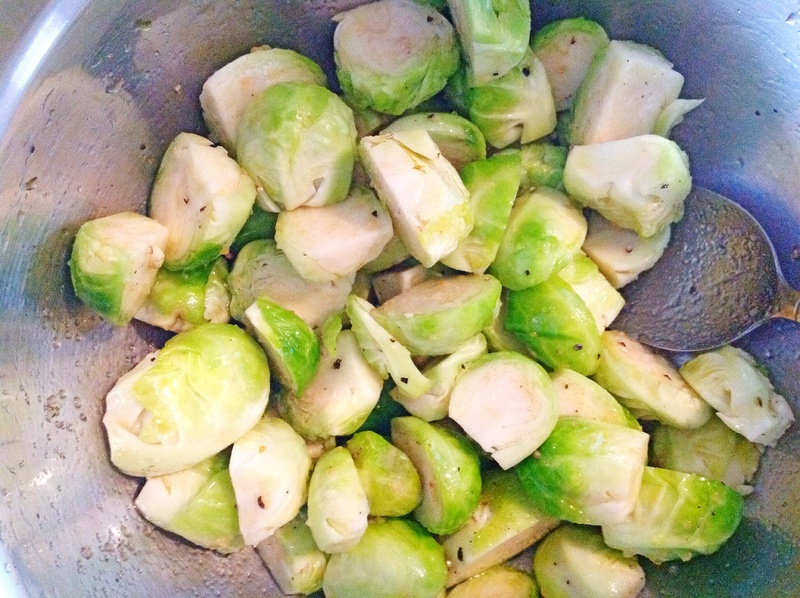 Cook for 10-15 minute, or until the brussels sprouts take on a significant amount of color and they become crisp and tender. Sprinkle the sprouts with half the cheese and cook for another minute or two, just until cheese melts and becomes crisp, remove the sprouts from the oven, transfer them to the bowl with the lemon juice and the red pepper flakes, toss well to coat the brussels sprouts with the lemon juice, sprinkle with the remaining cheese, serve immediately and enjoy! 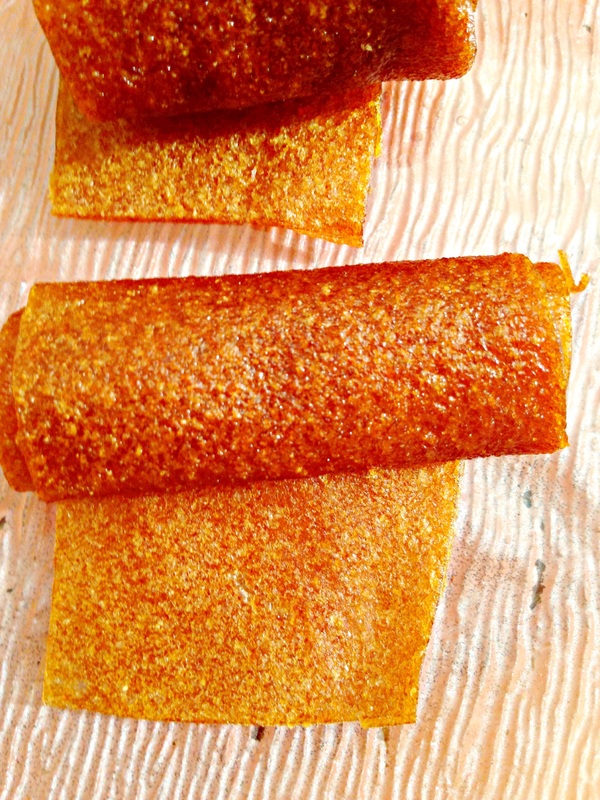 These are crispy, tangy with a little kick! 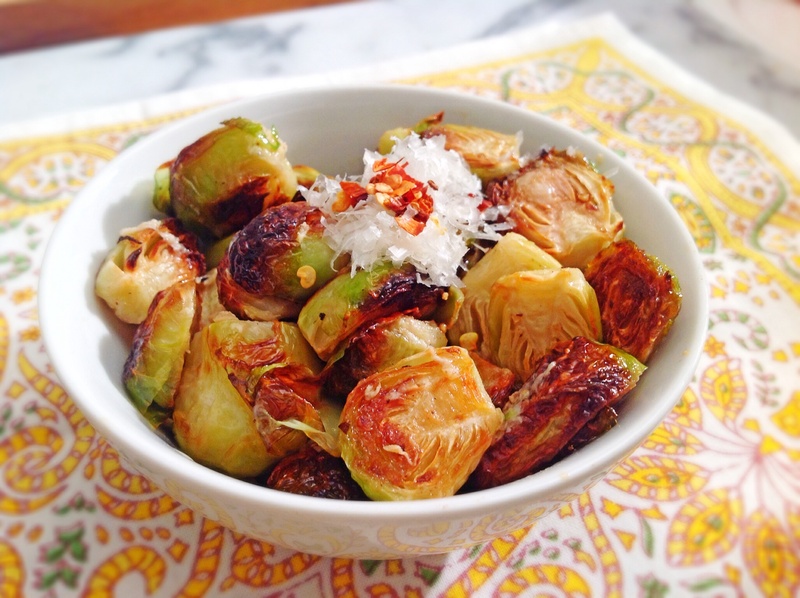 They are the perfect side dish for almost any meal! I love a great salad. One of my favorite salads to eat when I eat out is a simple garden salad that I get at a local health food market that I frequent. The salad is simple in every way, fresh mixed greens, topped with fresh mushrooms, carrots, and beets. What makes this salad better than other salads? That’s simple, the tahini dressing that accompanies it. 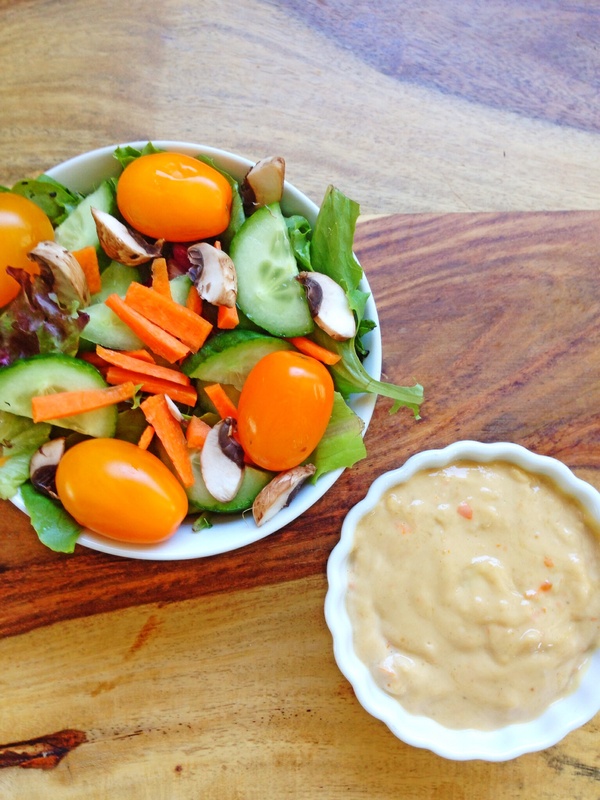 The dressing is one of the best salad dressings that I have ever tasted. The only problem is that the restaurant doesn’t sell it in a bottle, so I can’t take it home to use at a later time, and the restaurant is very secretive about what exactly is in the dressing. I’ve asked a thousand and one times, but they won’t give me the recipe. Sort of like they wouldn’t give me the recipe for their gingered greens, which I also love. 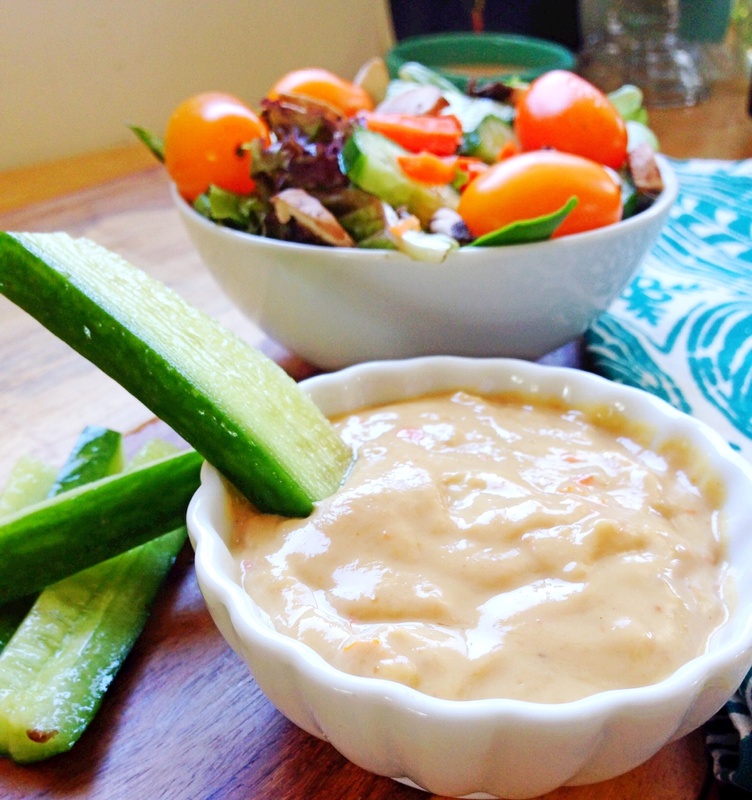 So as usual, I had to experiment, and come up with my own version, and it is amazingly close to their tahini dressing– exact actually. It is so good! 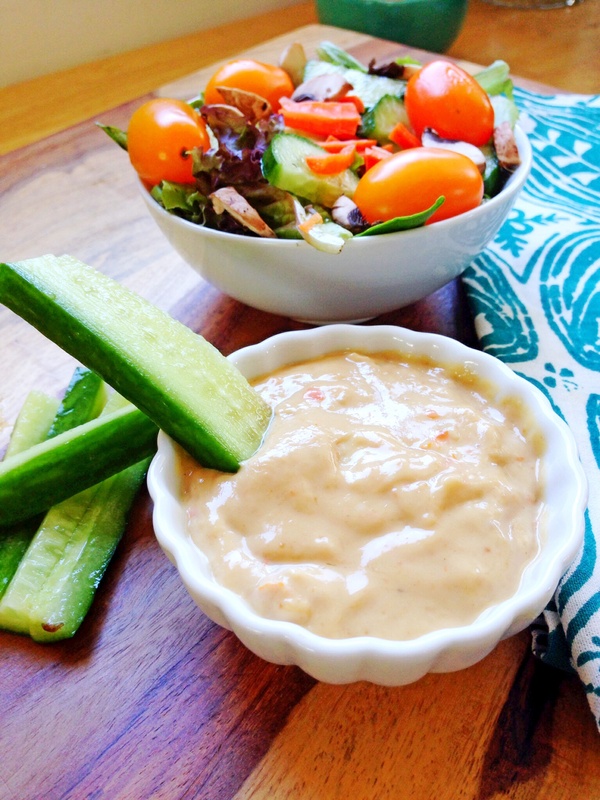 You can use it to dress a salad, but it’s equally good as a dip for cucumber, carrot, and celery sticks. My daughter loves it, with a capital L, and the best part is that nothing in it is bad for you. It’s high in protein, because it contains both sesame and cashew butters. 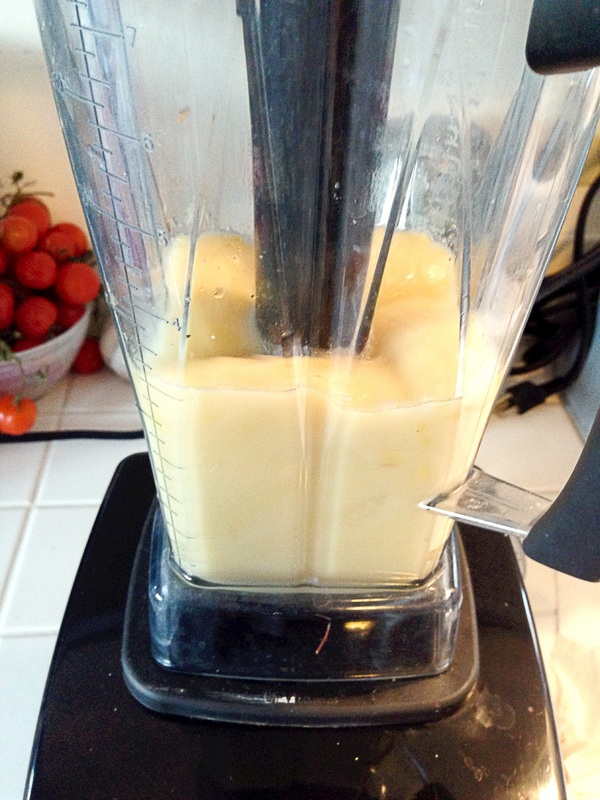 Directions: Place all of the ingredients in a blender or processor and blend until smooth. Pour into a serving container and enjoy! This would be awesome on grilled veggies as well! !